This is Kitty, Kinsey's sister. Kitty has been staying with Kinsey for the past few months. Unfortunately, the owners Ernie and Blanche will be returning this month, and the day has come for them to move out. They have both been busy packing boxes. Kinsey's belongings will be going into storage until her house is ready. Packing up a household takes a lot of effort and is very tiring work! "Only one last box to fill," said Kinsey. After everything was boxed, taped and labeled, the two exhausted sisters sat on the couch staring into space. "We deserve a fabulous holiday," exclaimed Kitty. "Sounds good to me," said Kinsey. Poor dears! Packing is no fun. But at least they can rest now. Time to plan a nice vacation! Poor Kinsey and Kitty! Yes moving is very hard work. 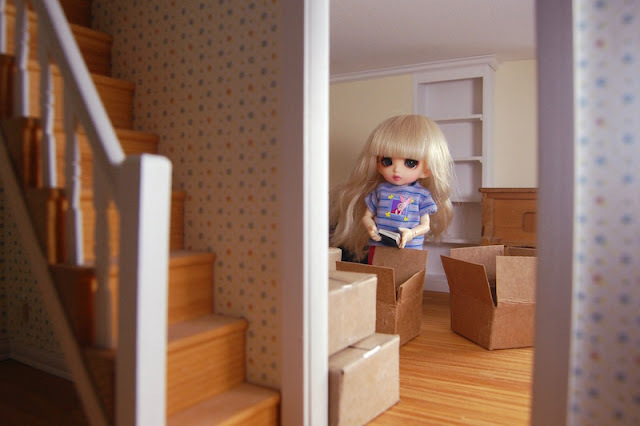 But tell her to just think of all the wonderful memories she and Kitty will make in her new house when it is finished. I do agree with Kitty on the subject of them taking a well deserved vacation! Poor Kinsey. She has been looking forward to moving but I have had no time to work on her house. I really need to get busy and make sure that she is not homeless. Packing is never fun and saying goodbye to a home isn't either but there's a new home in the future and a vacation. And that is always fun! Yes, I am sure that these two sisters will have a fun vacation while I try to finish Kinsey's house. Packing sure isn't fun! A vacation is the ideal award :-). The photos are beautiful, and I love the piano! Thanks! Kinsey loves to play the piano. How lovely that they got to spend time together...even though some of it was spent packing. I cannot wait to see them when the house is ready. And I was expecting they'd deserve a cup of coffee… *LOL* But of course a vacation is the best reward after all this work and effort. I'm really looking forward to hear more about the sisters' holiday - and to see Kinsey's new home. Hi Sam! I am so glad to see Kinsey has the help of her sister! Moving is hard work!!! They look so sweet together... I hope their new house will be ready for them soon! But meanwhile, a Vacation sounds lovely too! Thanks! Yes, Kinsey is very lucky to have her sister helping her. Plus, life is just more fun with a sibling! WOW they have been busy! And I agree, moving house and all that goes into it, is very very hard work. They really do need a good holiday now! Thanks Sharon. I agree, the two girls deserve a great holiday somewhere special! I helped a couple of friends pack and move house and IT IS hard work so I'm glad that the sisters are doing it together. I wish them a wonderful and well-deserved holiday time! To view "Days of our Little Lives" click here. Hi everyone. 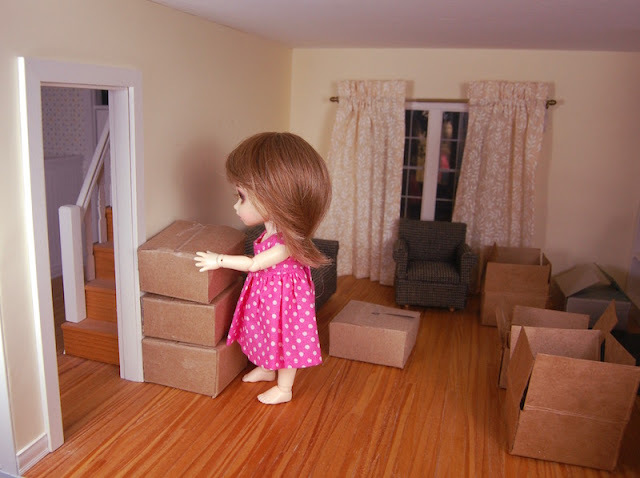 I am Sam (the human) and I love to build and renovate dollhouses for fun. This blog is mostly about my dolls and their many adventures with my dollhouses. My cousin is on his way!